For the first time in over 30 years steamer clams were harvested in Dorchester's Malibu Bay. The story was reported in the Boston Globe this morning. To read the story click here. Globe reporter Erin Ainsworth was walking her dog with a friend when she noticed the team of diggers at work. Like oysters, steamer clams are filter feeders that remove silt, bacteria and nitrogen from the water column. Because there is some level of pollution in the area, the clamss need to spend a period being treated in a Newburyport facility before they can enter the food stream. Based on our pilot experience with oysters at Dorchester Yacht Club last Summer this should be a good area for shellfish. Our oysters grew very well, but were removed at the request of the Division of Marine Fisheries. The reopening is the result of a lot of hard work at the State's Division of Marine Fisheries. They have an active steamer restoration program. We view it favorably for several reasons. 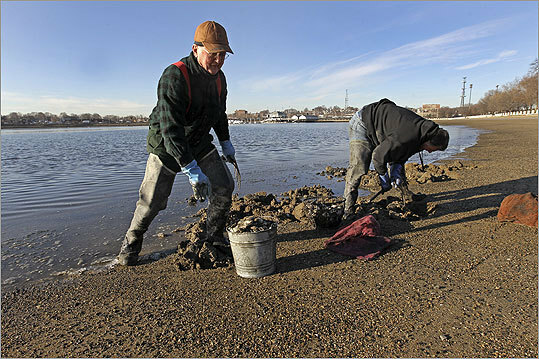 First, the new clamming grounds are another sign of the resurgence of Boston Harbor. Second, it will bring people to the water's edge. Having the harvesters there periodically will make the area safer. And finally, having a healthy shellfish industry is good for the Harbor. The shell fishermen can be good advocates for taking care of this valuable resource. 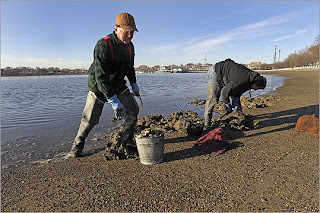 For example, millions of dollars are invested in the Chesapeake Bays oyster restoration effort. Much of it from our tax dollars. Yet Boston Harbor has only MOP on the oyster side. Why? : The Chesapeake oystermen lobby and fight for oysters. They have an economic reason for pushing for restoration. So if we can increase the stakeholders who care about water quality and using the Harbor productively,we can increase the impetus for moving forward.